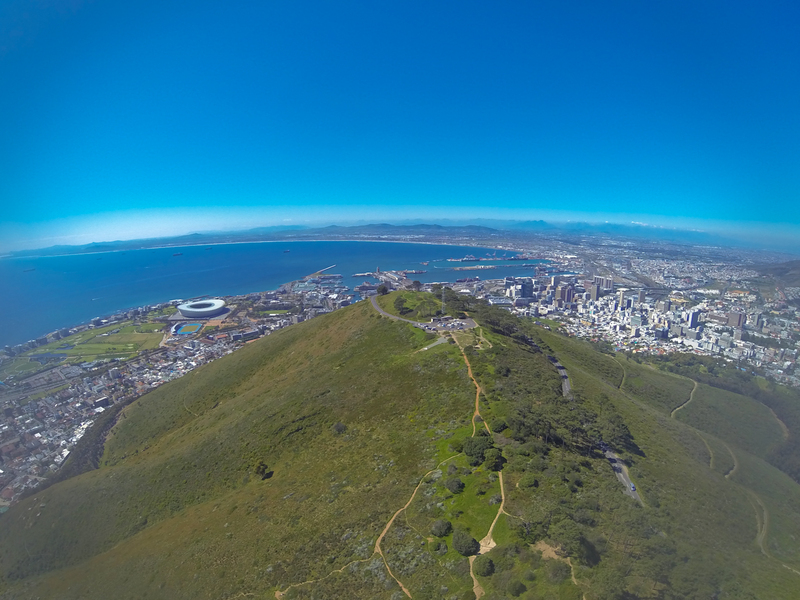 A quick Google image search of Cape Town will bring back some incredible images – but the one that always catches my eye is the aerial view over the city…an incredible panoramic view cover 2 oceans, beaches, surf, cityscapes and the football stadium all nestled at the foot of Table Mountain. So knowing that I was heading that way I had to figure out a way to see it for myself – without the incredible cost of a scenic helicopter ride! 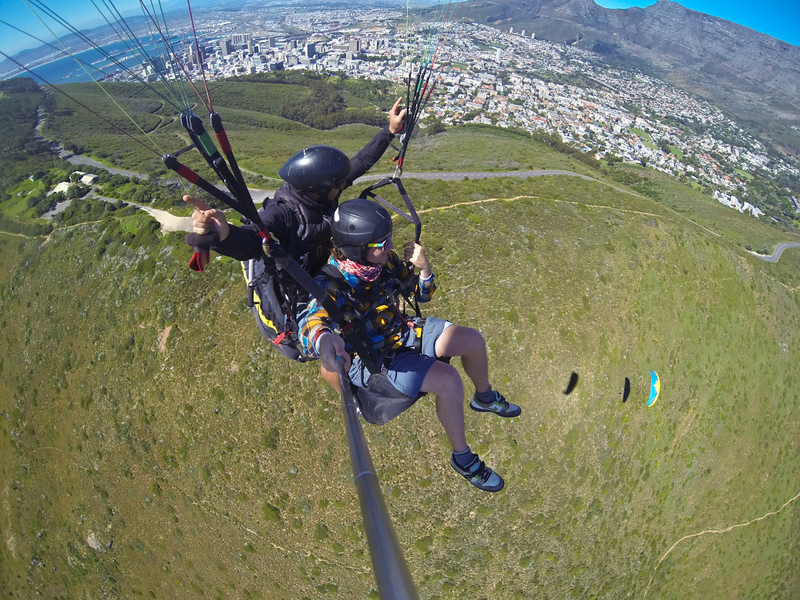 With a quick bit of research on things to do in Cape Town I was stoked to discover that there are numerous companies offering scenic paragliding flights from Signal Hill – one of the lower levels of the Table Mountain and I was determined to make sure it got pencilled into my stay! I’ve been paragliding before amongst the mountains of Switzerland a few years back and I was instantly hooked. Despite my fear of heights it was an incredibly relaxing experience and one I’m always keen to repeat to get an alternative perspective on where I’m exploring. Give the low cost (roughly £60 for a 45 minute flight) it was the perfect way to take in the views and capture the picture of Cape Town from the air without killing my wallet in the process! Having made my way to the city from Muizenberg (an easy hour on the train to Cape Town central) I jumped in the Fly Cape Town Paragliding van and took in the views of the winding mountain road to Signal Hill. The views from the car were incredible enough – so I was buzzing to get in the air! 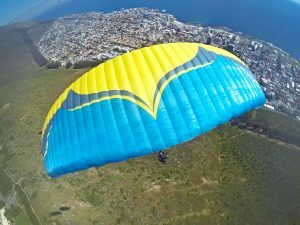 Now if you haven’t been paragliding before you may well have a bit of a misconception about it – I’ve heard some liken it to skydiving when chatting about things they want to do but to be honest nothing could be further from the truth. Paragliding is actually a heaps relaxing and tranquil thing to do! After a quick run off you’re soaring through the air before you even realise, safely buckled in, chilling in a really comfortable harness seat with your pilot nestled behind you – all you have to do is sit back, ask some questions about the area and enjoy the ride! And enjoy it I did! 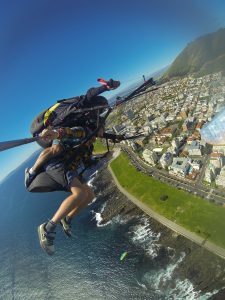 As we climbed the thermals on a near perfect flying day the views met every expectation I had of them – blue skies, sprawling coastlines, high rise city building and of course that famous overview of Table Mountain which dominates the skyline of Cape Town. As we climbed higher and higher the views stretched out further and further and to be honest I’m struggling a bit to describe them in a way that fully justifies them! Plainly put it was stunning! With me and my buddy Ally both in the air at same time our skilled pilots Stephan and Konstatin (who had recently returned from a competition in Europe and who are both highly ranked in the world of competitive paragliding) opted for some tricks to give our flight even more of a kick. At one point I looked above to our canopy and could make out the footprints of Ally stood on top of it mid flight – something we swooped around and promptly returned. It’s a bizarre experience soaring through the air in a stack of parachutes and people! With my GoPro selfies well on the go (standard blogger activity!) we headed towards the ocean with my pilot Konstantin asking if I fancied a bit of an adrenaline buzz before landing. Not one to turn down such an offer I promptly found my legs swinging above my head and going parallel to the ground as he banked the canopy around steeply for a few rotations before pulling out of it and spinning back the other way. It was like being in an aerial roller coaster and despite feeling rather queazy by the time we gently touched down in the landing area is certainly got a solid buzz on the go! A perfect way to end a gorgeous flight and yet another bucket list item being ticked off! If you’re heading to Cape Town I totally recommend it – it only takes a couple hours so it’s easily pencilled into your trip and it’s a unique way to take in the scenery. Yup climbing Table Mountain will give you the view – but paragliding allows you to see it in reverse, really putting the city and the landscape into perspective. As an added bonus they’re offering Backpacker Banter readers a R150 discount so it’s even cheaper to take in the views – just quote the promo code BPBDEAL when booking! For more information check out the Fly Cape Town Paragliding website – www.flycapetown.co.za – and they have heaps of awesome pics over on their Facebook Page too! Wow. I didn’t know you could just book and go paragliding! I thought it was something that needed a tonne of practice and training before you could attempt it. Definitely adding this to my bucket list – I’m good with take off and flying – always worried about how I’d manage the landing though! I have a history of breaking bones just by walking in the park! Tracey – Life Changing Year recently posted..There Are Big Differences Between Travelling And Living Local!